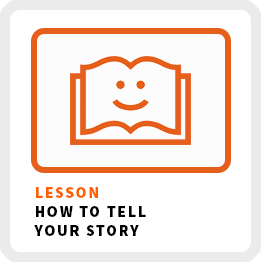 The spark for getting your business off the ground all starts with telling your story. Share your real story, not what you think people want to hear. Everyone deserves to have their story told and everyone owes it to themselves to live their own unique story. Learning how to tell your story is the first step toward designing the work you’ve always wanted to do. The simple habit of telling people what you want to do in life is an act of courage. It means you believe in your possibilities. You are publicly committing to your new identity (or the one you’ve been hiding). It is the spark that will begin a chain reaction of actions toward doing the work you’ve always wanted to do. I believe it’s one of the most important Life Skills That Matter. When someone asks you that question, what do you say? Do you tell them what you think they want to hear? Or do you tell them what you really want to do? When you tell them what you think they want to hear, you are telling them what you think you are “supposed to”. You are blowing your chance at potential game-changing connections. When you tell your story in the context of what you “want to do” you will share it with more enthusiasm and passion, which is infectious. People will be more interested in what you have to say. You are also giving people the opportunity to help you do the work you really want to do. They might offer connections, recommendations or support in some other way. Don’t deny yourself this opportunity. Say what you feel, not what you think. When you tell your story, your goal is to leave people with a specific understanding about what it is you do and how they can recommend you. The Madlib version of telling your story is I’m ________ and I’m a ________ for _________. Let’s figure out how to fill in those blanks. The first blank is obviously your name! In the second blank, you want to describe your expertise, skill, service or product. In my case it’s self-employment coach. In the third blank, you want to describe who your skill or service is helping. My target community is knowledge workers. If the person I’m speaking with is interested in more details, I follow up by describing the problem I’m solving for the community I’m serving. The problem I’m solving is preparing knowledge workers for the future of work by teaching them how to work for themselves. So when people ask me what I do, I say I’m a self-employment coach for knowledge workers. I help prepare them for the future of work by teaching them how to work for themselves. You might also know you want to make a change in your work, but don’t exactly have it all figured out yet. That’s OK. I want you to still tell the story about what you really feel. Share where you are at in your process right now. Don’t take the easy way out and tell people what they want to hear. You never know how someone might be able to help you figure out what it is you want to do. #1 Focus on the future. When you tell someone what you are doing right now, you are telling them what you think they want to hear. Don’t talk about your day job that’s making you miserable. Share where you want to take your career. Focusing on what’s next will excite you and boost your confidence. #2 Build on your past. When you want to make a big change in your life, it’s tempting to want to abandon your past accomplishments as you build your new identity. Don’t. Show how your past experiences will help you build the future direction of your work. I spent 20 years in broadcast media. The content creation, sales training and digital marketing skills I learned from that chapter in my career have been invaluable in my new direction to prepare you for the future of work. #3 Share what energizes you. Don’t be afraid to take a stand and to share your excitement. Proudly share what makes you passionate. Again, your enthusiasm is infectious and can motivate others to want to help you develop your work. Not everyone is going to be into what you want to do. Move onto the next person to look for people in alignment with the work you want to do!